"C'mon, General, admit it - 9/11 was an inside job!" A 9/11 truth Super Bowl?! 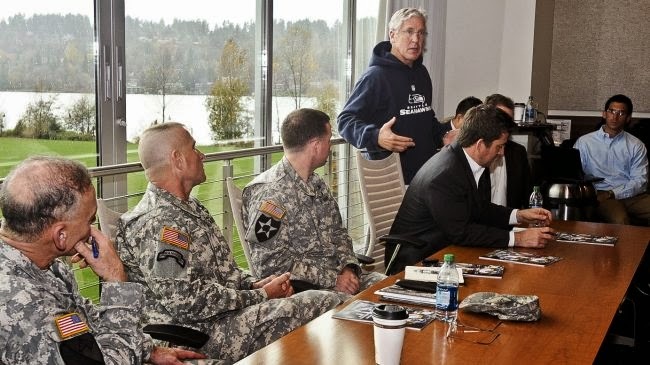 The sports blogosphere (and Press TV) asks: “Is Seahawks Coach Pete Carroll a 9/11 Truther?” “Report: Pete Carroll May Be 9/11 Truther” “Pete Carroll seeks truth about 9/11 from four-star general” “Pete Carroll, 9/11 Conspiracy Theorist.” Last spring, Carroll grilled four-star general, Peter Chiarelli, who had just retired as the US Army's Vice Chief of Staff – about whether 9/11 was an inside job. “Every 9/11 conspiracy theory you can think of, Pete asked about," said Riki Ellison, an ex-football player turned military advocate who was present at the meeting. Another false-flag bites the dust! Confirming Seymour Hersh's revelation that the al-Ghouta gas attack was a false-flag, a team of US security experts has concluded that the range of the rocket that delivered sarin that night was too short for the device to have been fired from the Syrian government positions where the Obama administration insists they came from. Experts Richard Lloyd and Theodore Postol conclude that the rocket likely had a maximum range of 2 kilometers, or just more than 1.2 miles, which means the rockets could not have come from land controlled by the Syrian government. More possible false-flag action: The US military wants to terrorize - I mean, help secure - the Olympics in Russia. Listen to Pentagon spokesman Rear Admiral John Kirby: "The United States has offered its full support to the Russian government as it conducts security preparations for the Winter Olympics. Air and naval assets, to include two Navy ships in the Black Sea, will be available if requested for all manner of contingencies in support of - and in consultation with - the Russian government." Putin is probably wondering whether those same assets will also be offered to US asset Bandar Bush, head of Saudi Intelligence, who recently threatened Russia with terrorist attacks during the Olympics if Russia didn't stop supporting Syria. Fake terror in Chicago? The Tribune story on the NATO 3 "terror trial" is headlined: Loud-mouth drunks or budding terrorists? The unusually honest mainstream story begins: "The first-ever terrorism prosecution by Cook County authorities began Tuesday with jurors hearing dramatically different views of the evidence against three out-of-state men charged with plotting terrorist attacks during the 2012 NATO summit in Chicago. Their attorneys told jurors their clients were just loudmouthed young men, often drunk, who were goaded on by undercover police officers desperate to make an arrest to help their superiors justify the enormous security costs that came with hosting the summit." A major victory for Snowden? The good news is that the NSA won't store all its metadata at its headquarters. The bad news is that it will be stored somewhere else where they can access it pretty much whenever they want. US spies want Snowden dead! “I would love to put a bullet in his head, ” one Pentagon official, a former special forces officer…"“In a world where I would not be restricted from killing an American, I personally would go and kill him myself,” said a current NSA analyst. "“Most everyone I talk to says he needs to be tried and hung, forget the trial and just hang him.” - Defense contractor. Snowden is appealing to the local government for protection after receiving threats against his life, his lawyer in Moscow said. Obama's NSA reforms "window dressing" Today’s speech full of minimization and outright denial regarding the now-documented massive scope of NSA spying on the population served as the presidential announcement of an intention to permanently implement a national surveillance grid and indiscriminate mass data collection. Every keystroke will still be captured, every phone call will still be logged. Judge rules "no fly list" unconstitutional: "A judge has ruled that the U.S. government must remove a Malaysian academic from the no fly list, rendering the infamous policy unconstitutional. Stanford University doctoral student Rahinah Ibrahim’s rights were violated when the federal government wrongly placed her on the list, according to U.S. District Judge William Alsup." Can cops search your cell phone during a traffic stop?! The US Supreme Court will decide when it rules on "stop and snoop" cases from California and Massachusetts. Acquittal of killer cops leads to protests - and more police violence! A protest over the acquittal of two former California police officers in the beating death of a homeless man turned violent Saturday when an apparent police provocateur assaulted a TV camerawoman, resulting in at least 14 arrests.The father of Kelly Thomas, who was beaten to death by Fullerton, CA police in 2011, thanked the demonstrators, saying that without their ongoing protests, the killer cops never would have even been put on trial. NY cops brutalize 84-yar old jaywalker. Cops bloodied an 84-year-old man and put him in the hospital Sunday when he jaywalked at an Upper West Side intersection and didn’t appear to understand their orders to stop, witnesses said. Kang Wong was strolling north on Broadway and crossing 96th Street at around 5 p.m., when an officer told him to halt because he had walked against the light…then beat him bloody. US pushes Iran out of Syria talks. American diplomats on Monday managed to salvage the Syria peace talks in Geneva, which almost blew up before they even began when Ban Ki-moon, the United Nations secretary general, issued an unexpected invitation to Iran to attend. What was Ban Ki-Moon thinking?! Obviously Iran, which is just a few hundred miles away from Syria, has no legitimate interest in what happens there - while the USA, almost 7, 000 miles away, gets to put al-Qaeda in charge of Syria if it wants to. No, America is NOT arrogant…because the word arrogant doesn't even begin to describe it. "Caesar" provides dubious Syrian atrocity photos. Anonymous Syrian opposition sources have given mainstream Zionist-controlled media outlets thousands of photographs of scarred, emaciated corpses. The photos supposedly came from a man who describes himself as a defector from the security forces of President Bashar al-Assad. A report on the photos by so-called experts was provided by the government of Qatar, a main sponsor of the Syrian opposition. NY Times: "The report does not reveal the name of the man who provided the photographs, identifying him by the pseudonym Caesar. That reminded some skeptics of Curveball, the code name assigned to the Iraqi defector whose bogus claims about mobile biological weapons labs triggered the American invasion of Iraq. The timing of the photos, which were supposedly vetted in record time and emerged on the eve of the Geneva conference on Syria, added to skeptics' suspicions. Syrian rebels are not only rebelling against Asad -but also against cease fire agreements. What's the fighting in Syria really all about? Israel has granted oil exploration rights inside Syria, in the occupied Golan Heights, to Genie Energy. Major shareholders of Genie Energy, which also has interests in shale gas in the United States and shale oil in Israel, iinclude Rupert Murdoch and Lord Jacob Rothschild. The Guardian calls for Israeli nuclear transparency When former Knesset speaker Avraham Burg openly declared Israeli possession of both nuclear and chemical weapons, and described the official non-disclosure policy as "outdated and childish," a right-wing group formally called for a police investigation for treason. But the details of Israel's 50 years of nuclear insanity - including theft and espionage, proliferation including giving bombs to South Africa and North Korea, and threatening to destroy the world with the "Sampson option" - are well-known despite the official secrecy. Canada has a "moral obligation" to support Israel - according to Jason Kenney, Canadian Prime Minister Stephen Harper's point-man for raising Jewish money. "“Israel faces a daily existential struggle for its survival (and) is a refuge for the Jewish people born out of the ashes of the Holocaust," Kenney said. He did not explain why whatever the Germans may or may not have done can possibly support the theft of even one square foot of Palestinian land - much less the wholesale Zionist genocide of the Palestinian people. Why won't Obama come clean about Fukushima? Is it because General Electric's Mark 1 BWR reactors that melted down in Fukushima have been known to be big-time accidents waiting to happen since 1972? According to the NY Times, back in 1972, Stephen Hanauer, an official at the atomic Energy Commission recommended that General Electric’s Mark 1 design be discontinued as it presented unacceptable safety risks. But Hanauer was ignored, Fukushima happened, and the Pacific has been poisoned. General Electric is the world's biggest company, America's biggest defense contractor, and a major force behind America's criminal "deep state." Tony Blair subjected to citizen's arrest! On Friday, Tony Blair was subjected to a humiliating citizen’s arrest attempt by a DJ working as a barman at a London restaurant called the Tramshed. The DJ followed the heroic example of civil resistance pioneer Splitting-the-Sky, who tried to arrest George W. Bush for war crimes during Bush's first trip outside the US after he stepped down in 2008.